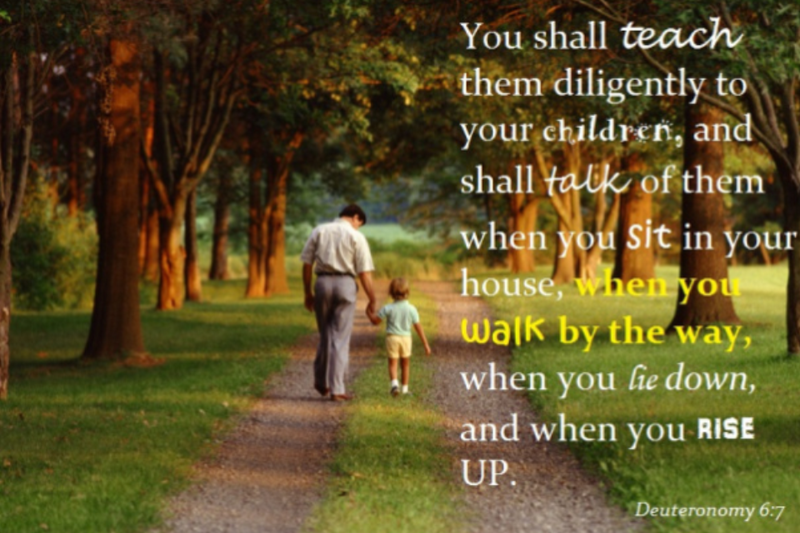 Who Exactly… Is Teaching Your Kids Scripture? This is the most commonly quoted portion of scripture when referencing the proper education of Christian children, by Christians. My only issue with referencing it for such a purpose? I’m not an Old Testament Jew. I’m a Gentile, Christian dad, living in the 21st century. Does this one directly apply to me? Uh, no… I wasn’t in Horeb, roughly 3,400 years ago. This reference doesn’t directly apply to me either, nor does it directly apply to anyone in the church today. So, what do we (brethren) do with these verses, in terms of application? Well, hermeneutically speaking, the PRINCIPLES may be applied to us today, but not the direct commands. Now, I can’t be certain, but I think it’s pretty safe to assume that most Christians reading this do not practice the wearing of “signs on their hands” or “frontlets” between their eyes. Nor do most write Mosaic Laws on their door posts. However, the basic principles laid out here, in terms of educating our children spiritually, is something we can glean from. We should be encouraged to use every opportunity possible, every aspect of our lives, for the purpose of bringing up our children without excuse regarding special revelation. In other words, we are to be diligent in discipling our saved children, and we are to be diligent in evangelizing our unsaved children, with regards to the things of God (in all that we do). We shall “talk of them” when we “sit” in our house, and when we “walk by the way”, and when we “lie down”, and when we “rise”. Principally speaking, this includes when we are watching tv, driving in the car, on line at the grocery store, etc. In other words, whatever we are doing, such is an opportunity to edify our children in the things of God. There is though, one other important principle we can glean from these scriptures, regarding our children’s spiritual growth. Did you notice who is to be teaching our children such things in the Deuteronomy references? Us… the parents. In fact, the only ones whom children are commanded to be obedient to in scripture, are their parents (Exodus 20:12). So, why do we even consider passing our children unto others, when it comes to training up our children in the Lord? Stop stealing my blog ideas! Just kidding. Great stuff!